Lancaster Masonic Hall was the venue for members of Rowley Chapter No 1051 and their guests, to celebrate the significant milestone of 150 years since its consecration on the 15 March 1869. 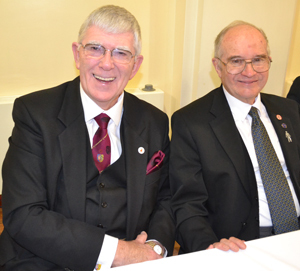 Rowley Chapter is the oldest chapter in the Lancaster and District Group and to help celebrate this unique occasion, Grand Superintendent Tony Harrison attended the chapter on a private visit. Tony Harrison (left) celebrating the 150 year anniversary of Rowley Chapter with the first principal Anthony Woof Jackson. A number of locally based grand officers also came along to support Rowley Chapter, including Assistant to the Provincial Grand Principals Chris Butterfield, Jim Wilson and Peter Mason, together with acting Provincial grand officers Andrew Bartlett, David Tattersall, Chris Larder and Lancaster and District Vice Chairman Scott Devine. After the chapter had been opened by the three principals, Anthony (Tony) Woof Jackson, Peter Pemberton and Phil Irving, Brian Milner then took to the floor, to read a paper on the history of the chapter and the early history of Lancaster, which had been prepared by the DC Doug Willoughby. The founding of the chapter is recorded in the minute book of the chapter, which records that in April 1848 several companions of the degree of the Royal Arch residing in and near Lancaster, having felt the very great inconvenience of going to another town whenever they desired to attend meetings of the Royal arch Chapter sent a petition to the Provincial Scribe E, to form a new chapter to be named Rowley Chapter and to be attached to the Rowley Lodge No 1051. The consecration of the chapter took place on the 15 March 1869 at the Masonic Rooms, Atheneum, St Leonard Gate, Lancaster (what is now the Grand Theatre). In 1884 the Queens Head Hotel, Church street, Lancaster, was purchased and became the new Masonic Hall. Rowley Chapter contributed to the purchase and held its first meeting there on the 8 May 1885. The chapter’s centenary meeting was held in the same building in 1969. Lancaster Masonic Hall has now moved to Rowley Court, situated on the outskirts of the town. In the early years of the chapter it was the custom, each December, to hold a ‘Grand Ball’ and a dispensation was granted for the three principals to wear their Royal Arch clothing and jewels at the ball, provided that the companions did not appear in such clothing outside the building where the ball took place. The functions were glittering affairs and received good press coverage and usually took place in the old Town Hall. During the past century, the names of over 400 companions have appeared on the nominal role. Many have proved to be distinguished Freemasons and have attained high rank. After Brian had completed his paper, the secretary John Heaton announced that a lapel pin had been designed and made to celebrate the anniversary, along with a booklet marking the chapter’s history (from which much of the history outlined in this article has been taken). Member and guests of Rowley Chapter enjoying the celebratory festive board. Roger Nevinson, then presented the chapter with a beautifully adorned trowel, which was graciously accepted by the first principal, who thanked Roger for his kindness and friendship. Following roger’s presentation, Tony presented the chapter with a ‘Patron’ certificate, honouring their contribution to the MCF 2021 Festival. At this juncture, Tony received a further £150 towards the charity and thanked all the companions of Rowley Chapter for their support of the MCF. At the festive board which followed, Tony spoke of his honour in being able to make this private visit to the chapter and was glad to be amongst so many friends. The event which had been celebrated this evening, Tony said, was a rare occurrence anywhere in the Province and one which he was proud to be a part of. Tony moved on to discus the MCF 2021 Festival and the Royal Arch in some depth and ended by drinking a toast to the health and future of Rowley Chapter. After the toast to the three principals by Brian Milner and the response by first principal Tony, it was time to think about going home, but not before it was announced that £247 had been raised for good causes from the raffle held at the festive board. The presentation of the ‘Patron’ certificate. Pictured from left to right, are: Peter Pemberton, Tony Harrison, Anthony Woof Jackson, Simon Hanson (group charity steward), Phil Irving and Geoff Bury (regional charity steward).